I planted lots of these last autumn to boost the stock I already had. Now I have a bed full of these tall beauties and they last forever. Last one for a few days. It’s bank holiday and I have family staying this coming week. Bittersweet as they’re off to live in the US for four years but it’s all very exciting for them. Tissues to the ready next week! Have a great bank holiday………I’ll be mostly planning a holiday in America! I just love this little pot that I bought in Reykjavik recently and keep putting it in paintings everywhere. 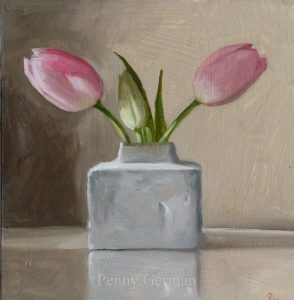 I’ve no idea what these tulips are called but they’re in our border so I just yanked a couple out mercilessly for today’s daily painting…….brutal, that’s me. I love anemones and their jewel-like colours. So, anyway, thought I’d let you in on some good news (unless you follow me on FB in which case….sorry to go on again). On Sunday I was elected an associate member of the Royal Birmingham Society of Artists which was very exciting. Next step is to go forward as a full member next year. The RBSA is a lovely society which, I have discovered, is the oldest royal society of art after the Royal Academy and former presidents include many of the pre-Raphaelite brotherhood. Their first exhibition was held under the patronage of many famous artists including JWTurner. There, a potted history for you. Below you can see the half-finished plein-air painting of the bluebells at Coton Manor. Last month, my subject at Coton Manor for April was the striking magnolia that grows by the lake. The month it just had to be bluebells so yesterday I took myself off to the bluebell woods there which were looking fabulous. I did a quick oil sketch and shall be painting the bluebells later in the week. 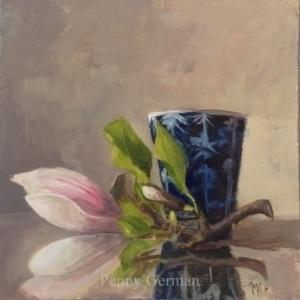 Here’s a little oil sketch of the magnolia and I’ll post a photo of the plein-air I did yesterday, tomorrow when I’ve sorted out a technical glitch. I sketched the last of my garden hellebores for a lovely couple who had missed out on the last ones. They popped by to pick them up yesterday as I was finishing a big painting. I seem to be having a rekindled relationship with flowers at the moment so will show you what I’ve been painting large-scale soon. In the meantime, here are said hellebores. Another demo piece from another workshop. I seem to be keeping myself pretty busy with these workshops lately but we’re heading up to Cumbria for Easter so I’m hoping for a bit of time to do some plein-air painting. Hoping for good weather too. Well, so much for getting back into the daily painting. I have been doing it but got out of the habit of blogging! Here’s a demo piece I did for the workshopees last week. I can’t believe the weather has turned so beautiful so I’m in my typical spring quandry – spring flowers or plein-air……aaagh, so much to paint, so little time. Enjoy the lovely weather this weekend. After a rather hectic March, I’m heading for a quieter period now (I hope) and a bit of a catch-up on the daily painting front. The sun is shining, the beds are weeded……..kind of and all is well in the world. Kicking off proceedings is a garlic bulb which has been hanging about in the studio for a while.